The first thing you’ll notice when you see a Star Trac Pro treadmill is that it is huge. This is not a home treadmill. This is a DC drive commercial treadmill. This treadmill is one of Star Trac’s high end commercial products, so expect it to have a very heavy price tag. It is currently being sold above $7,000. If you feel that this treadmill is beyond your budget, I suggest you visit other brands using the nav bar on the left side of this page or check out our best buy treadmills page and look for a treadmill that fits you best. 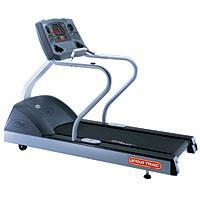 A new feature the Star Trac Pro treadmill has is the Aero Bar, a handle on the rounded cusp of the console. It is an innovative handle designed to make it easy for your users to grasp for extra stability. The 2.5HP continuous duty DC motor consistently delivers power even during heavy usage over a long period of time. It can reach speeds of 0.5-10 mph on 110 volts and 0.5 to 12 mph on 220 volts. However, I still believe that an AC motored treadmill would give you better value when you’re in the premium price range. The SoftTrac™ system is an advancement of the patented Impact Absoption System ™. It is a triple cell cushioning system that softens the impact of your user’s feet to maximize comfort and safety. The 62” x 20” running surface can elevate from 0-15% to give your users enough space and intensity for a proper workout. The Star Trac Pro treadmill also boasts a load-sensing auto shut-off feature that automatically stops the treadmill when no one’s on it. Plus, the two separate stop buttons are highly visible in key areas. Both features are included for the safety of your users. The IntelliTrac™ intuitive animated display, which is an enhancement on the typical dot matrix display, gives your users the ability to choose one of the automated Workout Partner™ selections—Athletic Partner, Climbing Partner or Weight Management Partner. The Star Trac Pro treadmill also includes the popular Personal Training Studio option, which enables 50 personal trainers to design and save their own custom “signature” treadmill exercise programs on each machine. As a result, more users would use it because there are more workout programs to choose from. It uses the iPulse™ heart rate system to monitor user’s heart rate. It’s in an independent window with interactive heart rate chart, and constant pulse detection to make it easy for your users to monitor their progress. The built in Dynamic Heart Rate Control™ program allows for constant tracking of the user’s heart rate. This program would continuously monitor heart rate and adjust elevation and/or speed to keep heart rates at a desired training level, thus creating an interval training effect for optimum heart rate training. Two 3-inch personal fans are built right into the sides of the console to keep your users cool and give them that needed extra energy during those intense workouts. Your users can even adjust the fan’s speed as they desire. The Digital Scale feature promotes self-monitoring and more accurate caloric reads. How? The digital scale has the ability to weigh the user. Then by acquiring the exact weight of the user, it enables the Star Trac Pro treadmill to more accurately produce a caloric expenditure readout. In addition, the Star Trac Pro treadmill features a maintenance diagnostic mode that allows you, the facility manager, to track hours, miles and specific programs used on each piece of equipment. And finally, it offers 3 years warranty for both its parts and labor. I believe that this an overpriced treadmill. Also, with its price tag, they should offer a stronger motor and longer warranties. I don’t recommend the Star Trac Pro treadmill. I believe that there are other commercial (or even home) treadmills out there that are better (and cheaper) than this model. See our best buy treadmills page. If you plan on buying a Star Trac Pro treadmill, I suggest you buy it at Amazon. They offer the cheapest price around the net. You can get it for just $7,880.00.